Adiponectin in vitro SimpleStep ELISA® (Enzyme-Linked Immunosorbent Assay) kit is designed for the quantitative measurement of Adiponectin protein in serum, plasma, and cell culture supernatant. Adiponectin is a 30kDa monomer that combines to form trimers (low molecular weight), hexamers (middle molecular weight), and other higher molecular weight multimers. ab222508 is formulated to denature these complexes and measure the total Adiponectin. Adiponectin is an important adipokine involved in fat metabolism and insulin sensitivity. Insulin stimulates the secretion of adiponectin. Decreased levels of adiponectin are associated with insulin resistance, whereas high levels of adiponectin are associated with reduced risk of type-2 diabetes. Synthesized exclusively by adipocytes and secreted into plasma. Defects in ADIPOQ are the cause of adiponectin deficiency (ADPND) [MIM:612556]. ADPND results in very low concentrations of plasma adiponectin. Genetic variations in ADIPOQ are associated with non-insulin-dependent diabetes mellitus (NIDDM) [MIM:125853]; also known as diabetes mellitus type 2. NIDDM is characterized by an autosomal dominant mode of inheritance, onset during adulthood and insulin resistance. The C1q domain is commonly called the globular domain. Hydroxylated Lys-33 was not identified in PubMed:16497731, probably due to poor representation of the N-terminal peptide in mass fingerprinting. HMW complexes are more extensively glycosylated than smaller oligomers. Hydroxylation and glycosylation of the lysine residues within the collagene-like domain of adiponectin seem to be critically involved in regulating the formation and/or secretion of HMW complexes and consequently contribute to the insulin-sensitizing activity of adiponectin in hepatocytes. O-glycosylated. Not N-glycosylated. O-linked glycans on hydroxylysines consist of Glc-Gal disaccharides bound to the oxygen atom of post-translationally added hydroxyl groups. Sialylated to varying degrees depending on tissue. Thr-22 appears to be the major site of sialylation. Higher sialylation found in SGBS adipocytes than in HEK fibroblasts. Sialylation is not required neither for heterodimerization nor for secretion. Not sialylated on the glycosylated hydroxylysines. Desialylated forms are rapidly cleared from the circulation. Our Abpromise guarantee covers the use of ab222508 in the following tested applications. The concentrations of Adiponectin were measured in duplicates, interpolated from the Adiponectin standard curves and corrected for sample dilution. Undiluted samples are as follows: serum 1:5,000, plasma (EDTA) 1: 2,500, plasma (heparin) 1: 5,000 and plasma (citrate) 1: 5,000. The interpolated dilution factor corrected values are plotted (mean +/- SD, n=2). The mean Adiponectin concentration was determined to be 7962 ng/mL in serum, 6106 ng/mL in plasma (EDTA), 7377ng/mL in plasma (heparin) and 7671 ng/mL in plasma (citrate). Interpolated dilution factor corrected values are plotted (mean +/- SD, n=2). The mean Adiponectin concentration was determined to be 9,188 ng/mL with a range of 3,048 – 47,443 ng/mL. The concentrations of Adiponectin were measured in duplicates, interpolated from the Adiponectin standard curves and corrected for sample dilution. 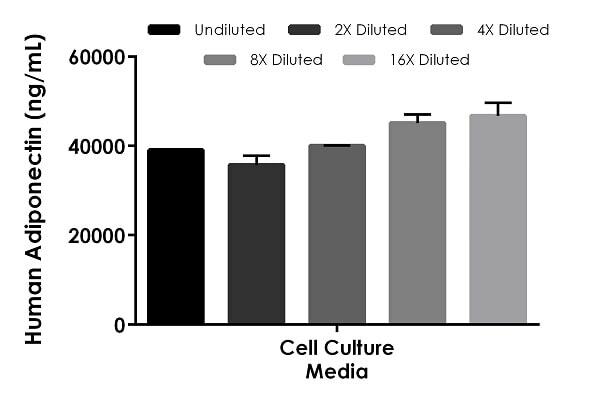 Undiluted samples are as follows: serum free cell culture media 2.5% (1:40). The interpolated dilution factor corrected values are plotted (mean +/- SD, n=2). ab222508 has not yet been referenced specifically in any publications. There are currently no Customer reviews or Questions for ab222508.